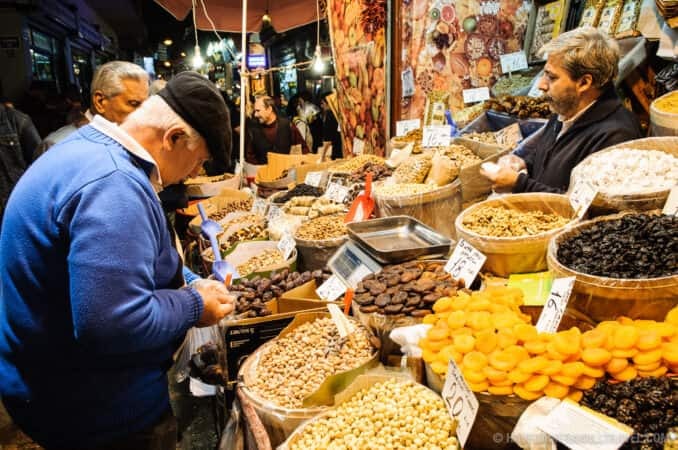 Lokum (Turkish Delight), nuts, sweets, and dried fruits. Photo by David Coleman. How to license & download this image. 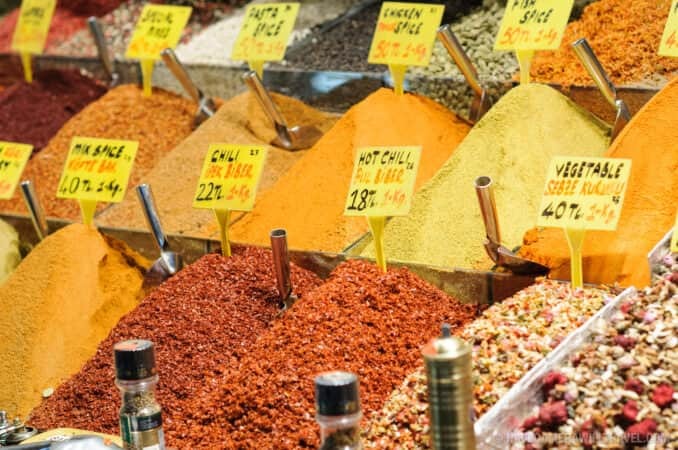 You can get much more than spices at the Spice Bazaar, but spices are the stars. They're stacked high in mounds that are not at all like the boring little jars we get in our supermarkets. You just know that they're going to taste better. And what colors! If you like cooking, you'll love this place. 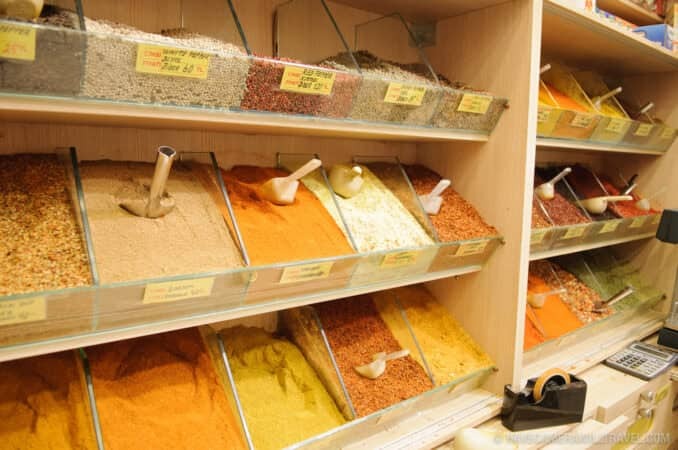 Whether you're after pure individual spices or mixes perfect for lamb or chicken, they're here. 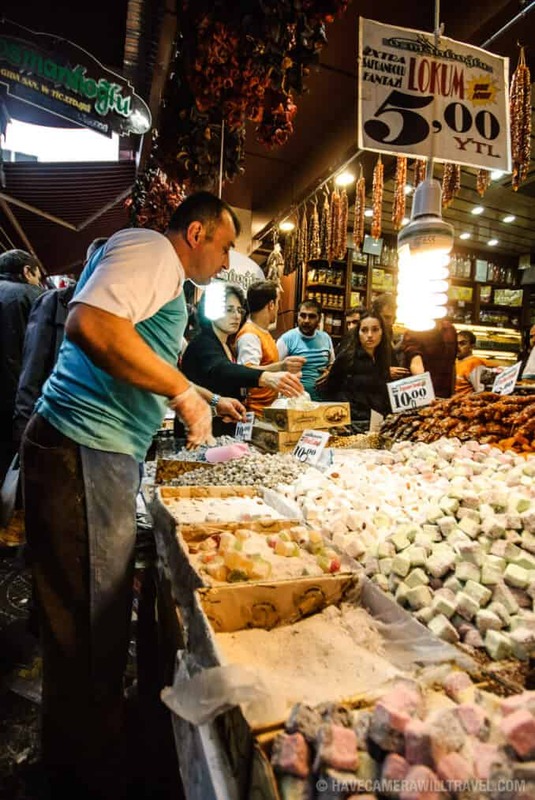 Located in the Eminonu quarter of Istanbul, next to the Galata Bridge and the New Mosque (Yeni Cami), the Spice Bazaar is one of the city's largest and most famous markets, second only to the Grand Bazaar. 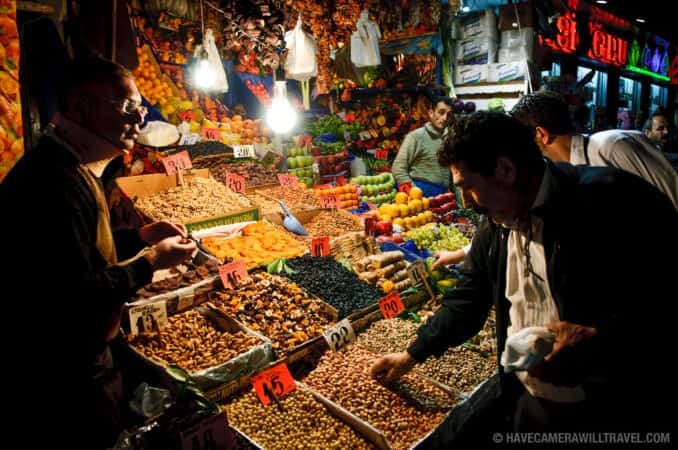 It's also known as the Egyptian Market, it's smaller than the Grand Bazaar, but it can be just as busy. 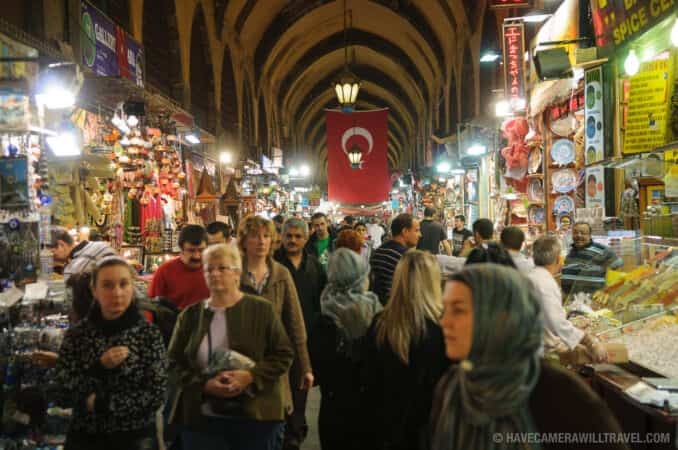 You don't come here for Turkish rugs--the Grand Bazaar is better for that--and there's a much stronger emphasis on food offerings like spices, nuts, dried fruits, baklava, and, of course, Turkish delight (lokum) in the traditional rose water as well as just about any flavoring you can think of. But more and more the foods are getting displaced by shops selling goods with larger profit margins like jewelry and souvenirs. Some of the more interesting vendors are actually outside the Bazaar. 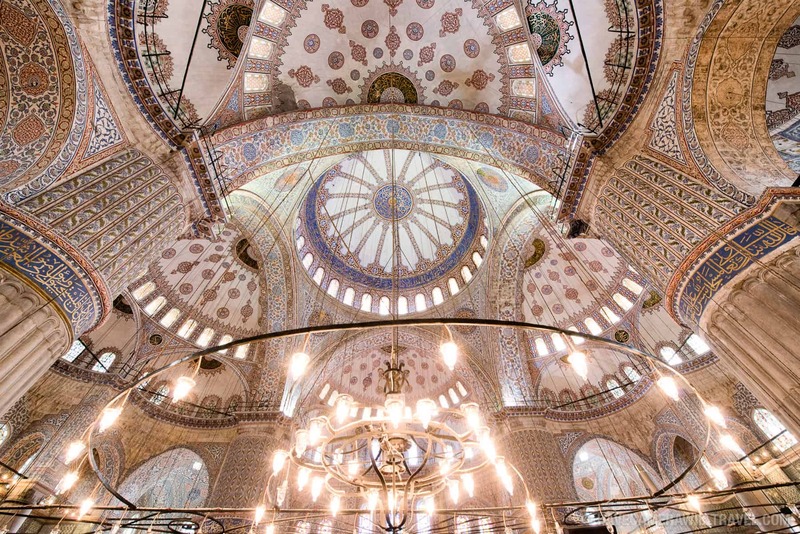 Lining its exterior walls are vendors catering more to locals than tourists. 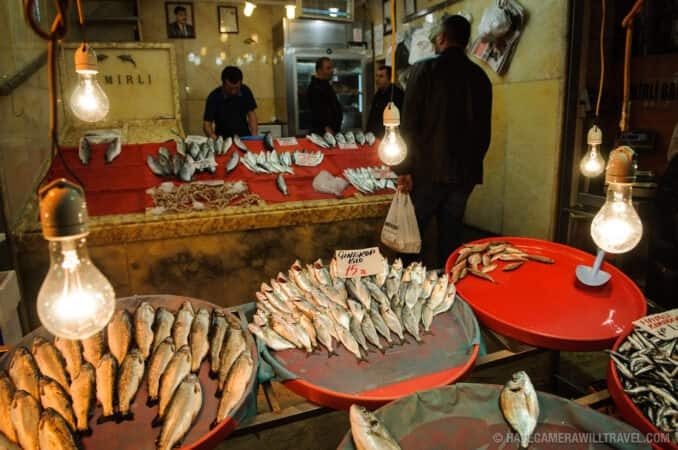 There you'll find a small fish market on one side, and on the other some shops dedicated to gardening, hardware, or even fish tank supplies. And the streets around the Spice Bazaar are especially interesting--you can find many of the same goods for sale at less touristy prices. 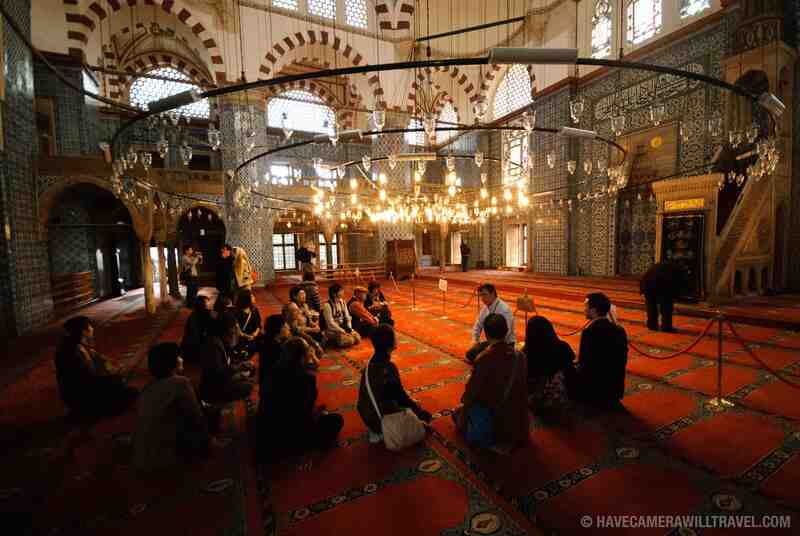 The Rüstem Pasha Mosque nearby is also worth a look. My favorite time down around this area is in the early evening, in the hour or two before the Spice Market closes. 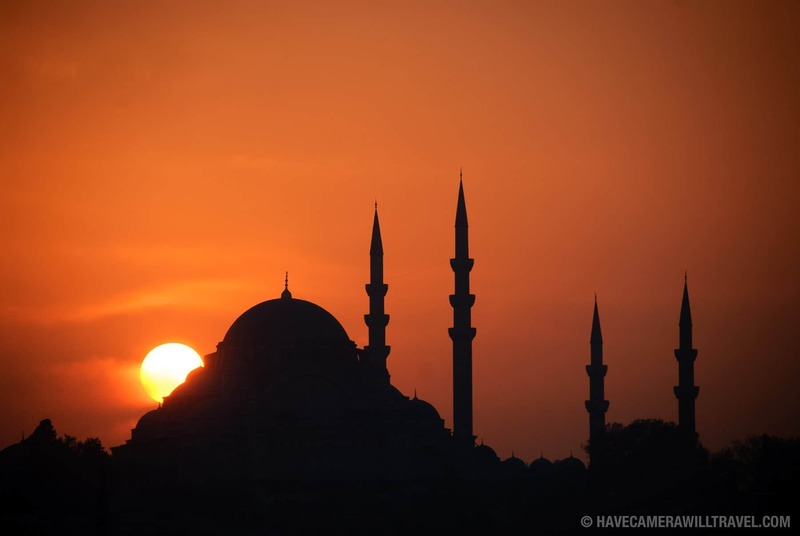 The Eminonu waterfront buzzes, the two plazas next to the New Mosque fill with people out and about, and the mosques fill with people. Spices. Photo by David Coleman. 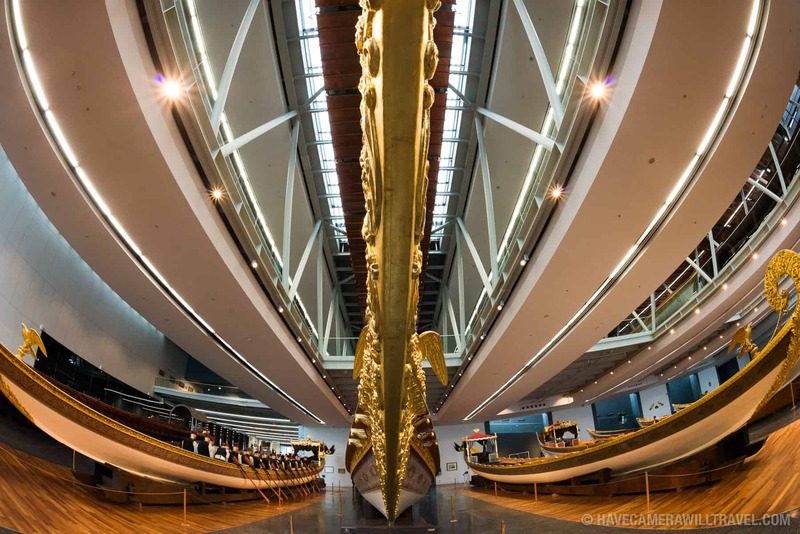 How to license & download this image. A fish shop on one of the outside streets. I loved these lightbulbs, but when I visited again a few years later, unfortunately the bulbs had been replaced with ugly CFLs. Better for the environment and for the shop's electricity bill, but much less photogenic. Photo by David Coleman. How to license & download this image. One of the outside streets lining the Bazaar. One of the main entrances is at the end of this street at the very right of the frame. Photo by David Coleman. How to license & download this image. 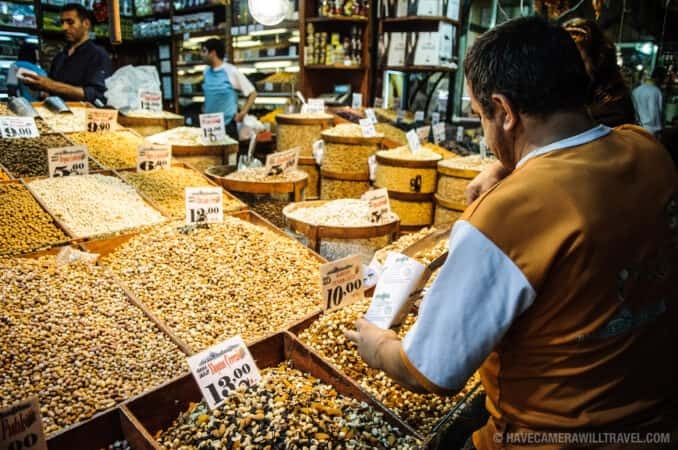 Nuts and dried fruits. Photo by David Coleman. How to license & download this image. A small sampling of the dozens of different spices available. Photo by David Coleman. How to license & download this image. 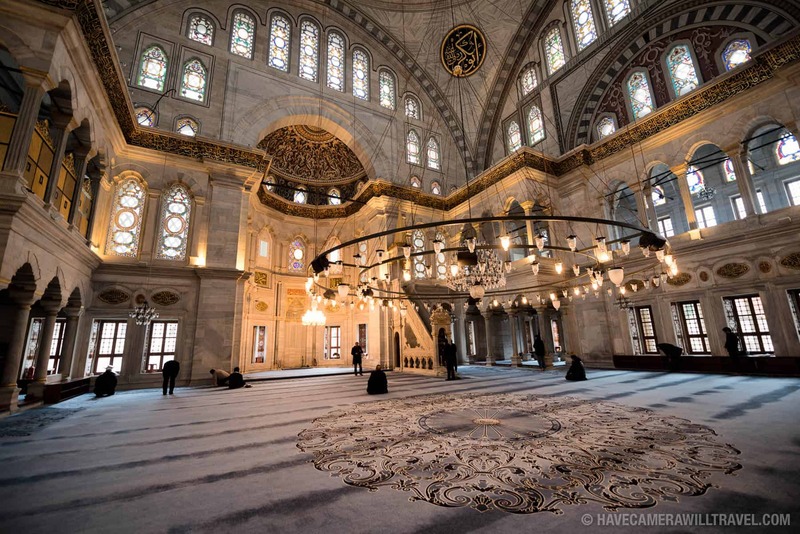 Its roof has been replaced with a much more stable and utilitarian roof, which is quite different from the patchier but older roof of the Grand Bazaar. Photo by David Coleman. How to license & download this image. This is the same fish shop as the shot with the lightbulbs, above, but taken a few years later after new lightbulb regulations had kicked in. Photo by David Coleman. How to license & download this image. A store specializing in lokum (Turkish Delight) with a huge selection of flavors (some better than others). Photo by David Coleman. How to license & download this image. This store occupies prime real estate on a busy street outside the market and is on the corner with the square. It always seems to be doing a roaring trade. Photo by David Coleman. How to license & download this image. No, not really. But it got your attention, right? Photo by David Coleman. How to license & download this image. A busy street inside the covered part of the Bazaar. 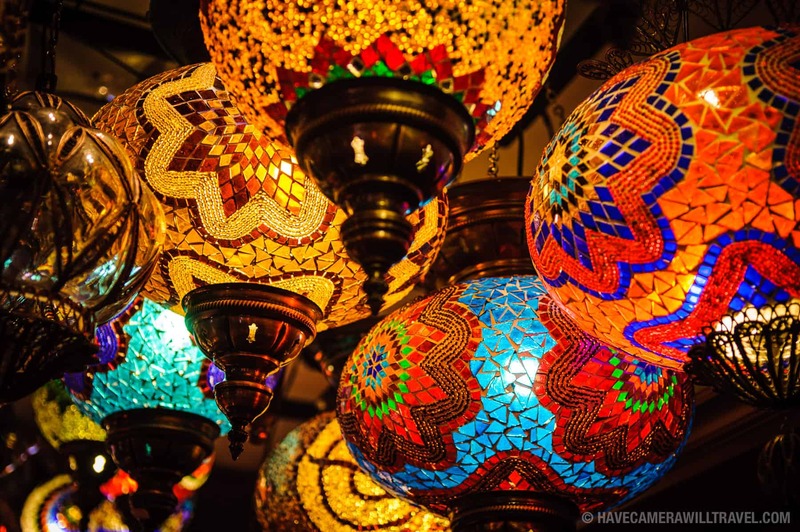 You can see some of the tourist stores that have come in selling the colored glass lamps and earthenware. Photo by David Coleman. How to license & download this image. Cinnamon and other spices. Photo by David Coleman. How to license & download this image. Many of the shops are essentially basic market stalls. 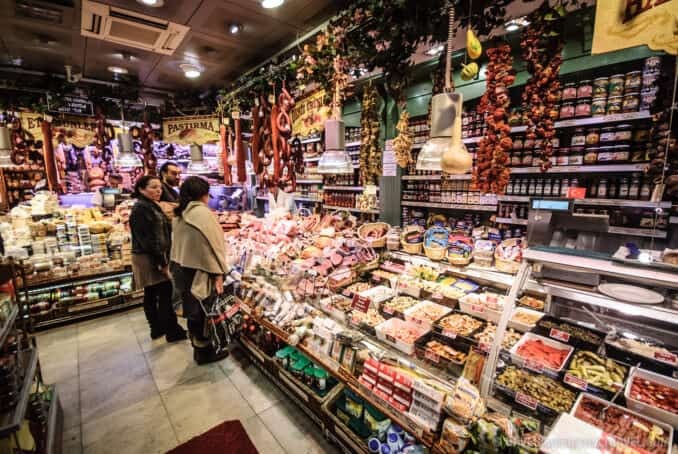 This delicatessen is one of the fancier and more-established permanent stores. Photo by David Coleman. How to license & download this image. 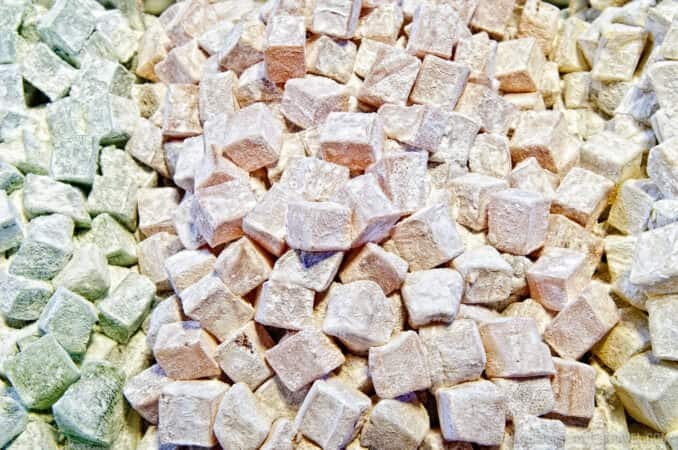 Lokum (aka Turkish Delight). Photo by David Coleman. How to license & download this image. Inside one of the more established stores. 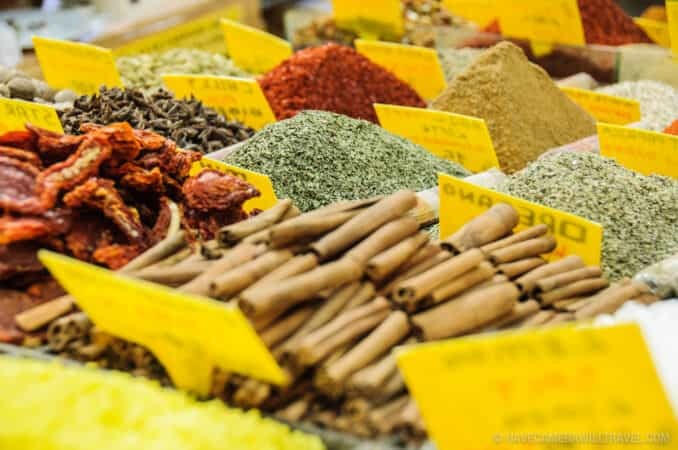 Some of these places can vacuum seal your spices to make them easier to travel with (check with your local customs rules before flying home with them, of course). Photo by David Coleman. How to license & download this image. One of the alleyways surrounding the main part of the market. Photo by David Coleman. How to license & download this image. 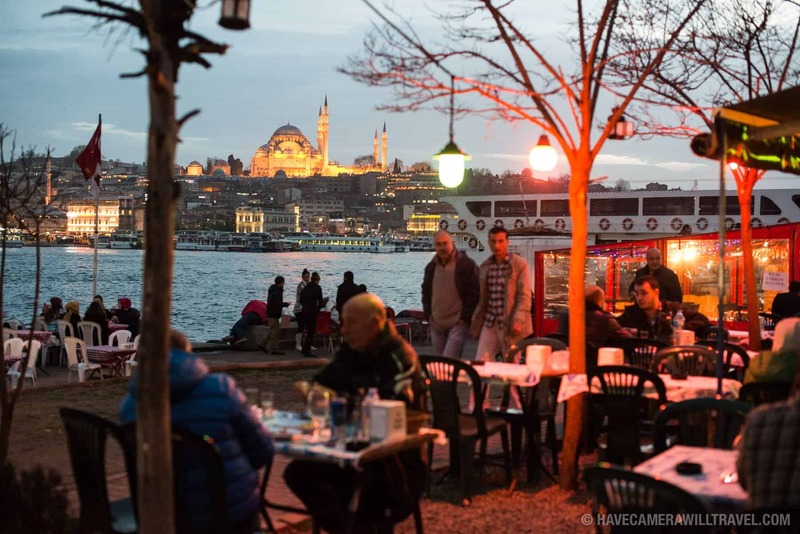 The Spice Bazaar is down near the waterfront of Eminonu, near the Galata Bridge and next to the New Mosque (Yeni Cami). It's next to the Eminonu tram stop on the T1 line. 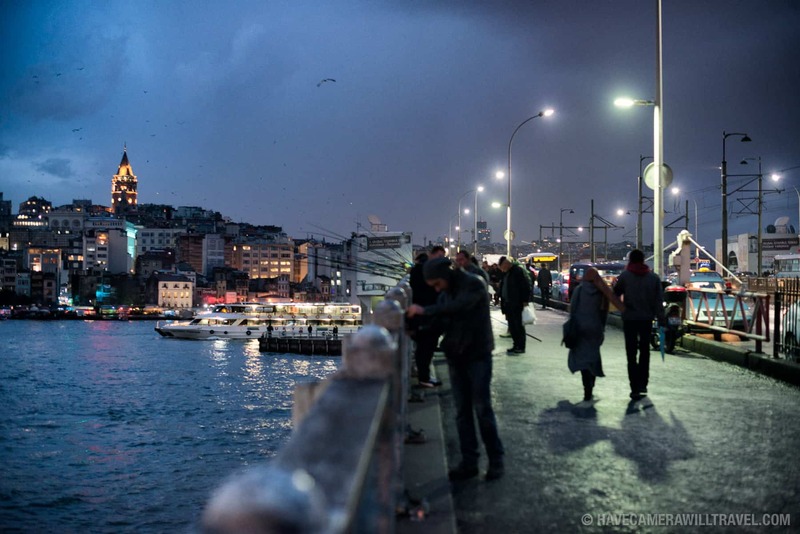 From Beyoglu, it's across the Galata Bridge, or you can also get a ferry to Eminonu. 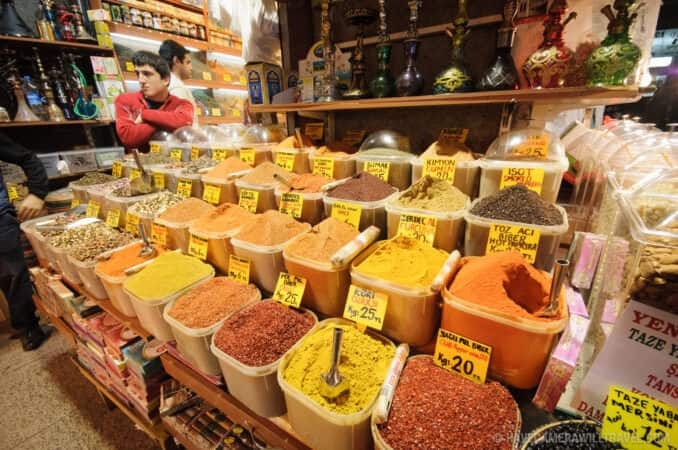 The Spice Bazaar is a lot smaller than the Grand Bazaar and is laid out of two covered "streets" at a right-angle, so you're unlikely to get lost. It gets crowded later in the day, but that's when it's at its best. 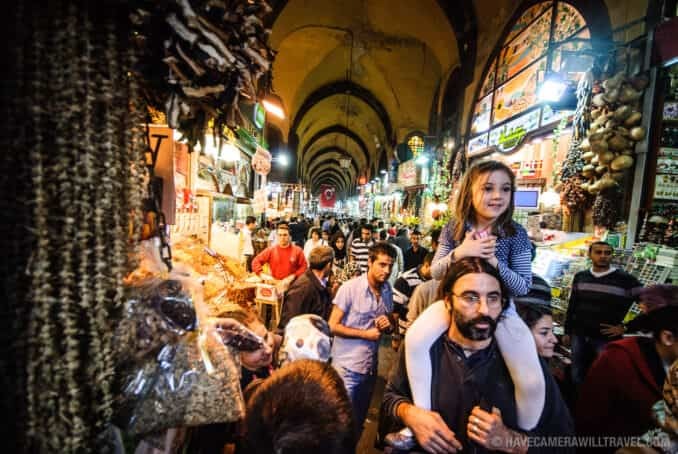 The Spice Bazaar keeps slightly different hours to the Grand Bazaar. 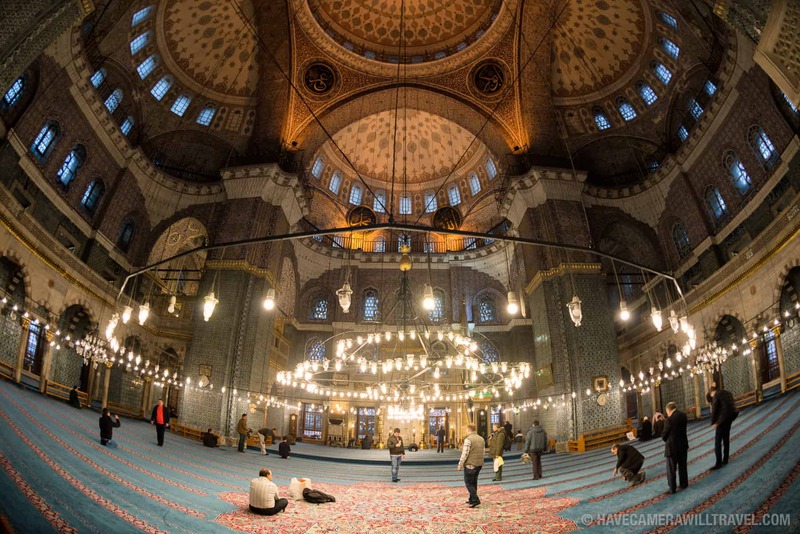 The most significant difference is that it's open on Sundays (the Grand Bazaar is closed on Sundays). 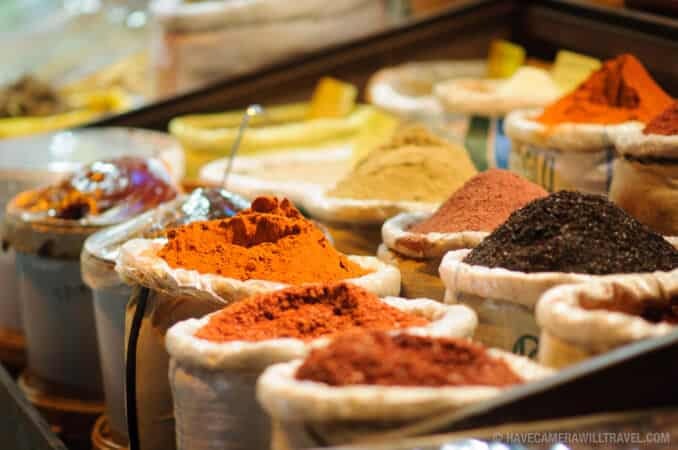 Many of the vendors can vacuum seal your spices, making it easier and cleaner to pack them in your luggage. 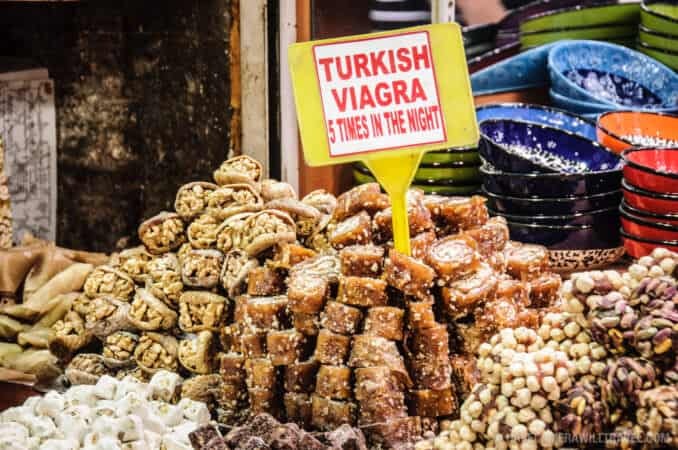 But do check with your local customs rules before flying home with them--some countries have very strict rules about such things. If in doubt, it's a good idea to declare them. 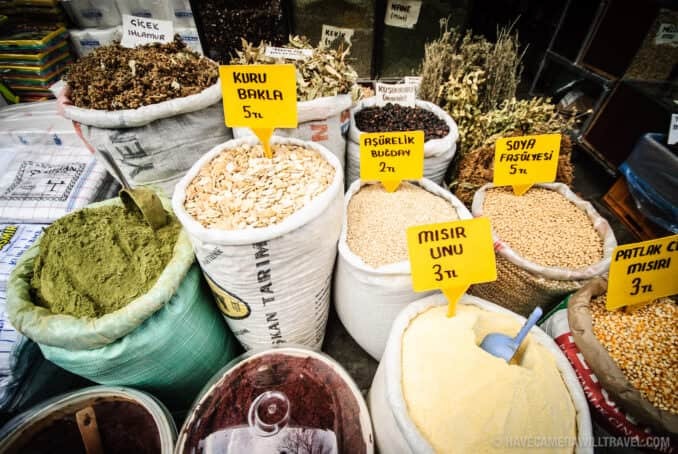 If you're looking to cook some Turkish cuisine, here's a handy guide to some useful spices to pick up. And if you're looking for a very good Turkish cookbook, this one is my favorite.